This is the entrance to the monastery compound and was built by Prior Walpole between 1396 and 1417. It was here that visitors would first report to gain admittance to the monastery, but the building was much more than a porter's lodge. Up until the time of the Dissolution of the Monasteries in 1539, it housed the local manorial courts which administered justice in both lay and ecclesiastical matters. 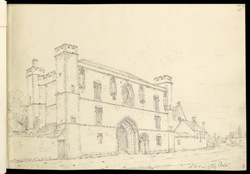 For a time it was also the town's jail and is now part of King's College, a boys' Public School.